This swing is vintage 2007. At this point in time, Tiger had worked with Hank Haney for a nearly five years and had comfortably settled into a swing that in my opinion was virtually perfect. In his 16 starts on Tour that year, his adjusted scoring average was 67.79. He won 7 of the 16 events he entered including the PGA and Tour Championship, and was runner-up at the Masters and U.S. Open. It was his last year that Woods dominated the PGA Tour (thus far). A “pulling” motion of the right shoulder blade and the rear lats. This gets the body rotating (or “swiveling”) directly around the spine. A perfect blend of the upward hinging of the left wrist (“dorsiflexion”), with the rotation of both forearms (“pronation”). Detracters complain that Tiger had become too flat under Haney’s tutelage. A flat swing plane is not detectable from watching this swing. When Tiger’s hands reach chest height, the shaft is now parallel to, and above, the original clubshaft plane. 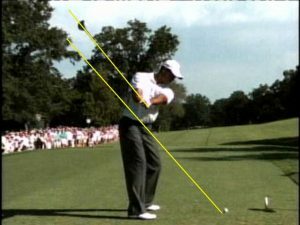 This defines what is means to be “on-plane.” If he was flat, the upper part of the shaft would be angled toward the original clubshaft plane. In fact, its angled a bit upward. 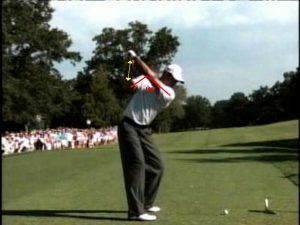 Notice the relationship of the upper right-arm to his shoulder-line as he reaches the top of the backswing. His shoulders have turned 90*, and his upper right-arm has nearly maintained its original relationship to the shoulder-line that was present at address. To better understand this, imagine that from a top-down view, the angle between his upper right-arm and shoulder-line has changed minimally (from 90* to about 105*). Maintaining this angle allows the right upper-arm to stay tucked “up-and-in” versus the shoulder-line, and keeps the right forearm relatively vertical to the ground. This puts the entire right arm in a perfectly loaded position to assist the body in torquing itself back down to the ball. There are two notable points to make about Tiger’s transition into the downswing. First is the centered torquing of the body from the top of the backswing down to the ball, which is a critical source of power in the swing. The key aspect to this torquing motion is that everything above the waist moves downward together. When physicist’s speak about the golf swing, they refer to it as a “double pendulum.” In a double pendulum, the left arm forms the first pendulum (with the left shoulder as a fulcrum), and the clubshaft forms the second pendulum (with the wrists as its fulcrum). In order for a double pendulum to deliver maximum force at it’s final release point (the bottom of the swing), all connected points of the pendulum (the left shoulder, left arm, wrists, and clubshaft) must begin their downward movement together at the same rate of change. Click on the video to the right to see Tiger’s transition downward into impact. Every piece of his upper body moves together. Every piece! The second is the beginning of his left side “compression phase.” Notice the angle he forms between his upper left side and his left thigh. As this angle becomes more acute, his body literally compresses itself into the ground. As he transitions into the downswing, this compression becomes more pronounced. The video to the right shows the angle compressing by 15*, from 120* to 104*. Many observers have criticized this move as an unnecessary “dipping” into the ball. 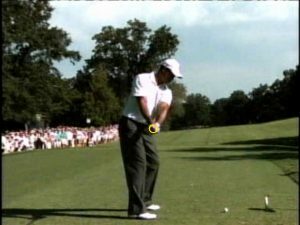 <strong>Tiger, and virtually every other great ball-striker, move downward into impact.</strong> The typical dip is from one-to-three inches. It is an important source of power, because it sets up the opportunity to subsequently post the left leg just before impact, unleashing a upward corkscrewing effect that turbocharges the body’s rotation (torque) through impact. To create and manage this compression requires tremendous athleticism, but all the great ball-strikers have mastered and incorporated some amount of it into their swings. The final feature to notice in Tiger’s swing is his balance through impact and the “discus throw” position he attains post impact. Once the bent right elbow and right wrist of his “loaded” right arm are released, the right arm straightens out and stretches upward. At this point, he looks like he’s just released from an Olympic discus throw. In order to maintain balance, his right foot stays back, remaining at a 45* angle versus the ground. <strong>His left shoulder is literally moving away from the target and compressing itself into the balance of the right heel.</strong> The best players in history, those with classic finishes like Ben Hogan, Sam Snead, Tom Watson, and Phil Mickelson, all do this. Let’s hope 2007 doesn’t turn out to be Tiger Woods last year where he dominates his tour peers. I for one will miss watching his technically correct golf swing.